This week's film noir is one of Humphrey Bogart and Lauren Bacall's best films. TCM will air The Big Sleep (1946) at 11:30 a.m. June 19 as part of its film noir festival, Summer of Darkness. I'll outline the noir elements of this classic murder mystery below. Director Howard Hawks' film noir classic, The Big Sleep (1946) is a triumph of style over substance. The movie features lots of noir atmosphere and dynamite performances, but its famously confusing plot is almost impossible to unravel. The Big Sleep is one of my favorite movies and although I've probably seen it dozens of times, I still can't figure out the "who" in this whodunit. However, not being able to solve the central mystery hasn't lessened my pleasure while watching this wonderful film. The Big Sleep is remarkable for Hawks' interpretation of Raymond Chandler's seedy underworld, the crackling dialogue, and the smoking hot chemistry between Humphrey Bogart and Lauren Bacall. The Plot: The Big Sleep, based on Chandler's 1939 crime novel, follows private detective Philip Marlowe (Bogart) who takes on the case of an elderly L.A. millionaire (Charles Waldron). The man wants to find out why his wild youngest daughter, Carmen (Martha Vickers), has run up a string of gambling debts. The real mystery begins when Marlowe finds a drugged Carmen in a cottage with the dead body of a gambling kingpin (Theodore von Eltz). The Big Sleep was completed in early 1945, but Warner Brothers put it on the shelf so they could release several World War II movies while they were still relevant (the war ended in August 1945). Meanwhile, Bogart and Bacall, who began a romance on the set of To Have and Have Not (1944), married to a storm of publicity in May 1945. 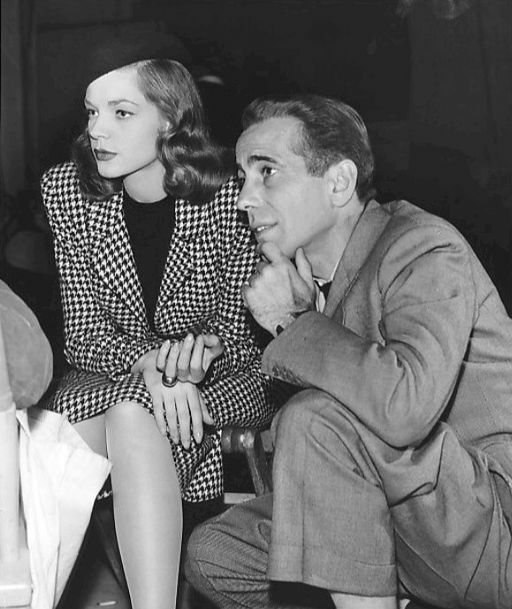 Bacall's agent wanted his star client to capitalize on all of the free press, so he coaxed studio chief Jack Warner into re-shooting many scenes so Bacall's part could be beefed up. A long scene that explains the complicated plot was cut to make room for more Bogie and Bacall, leaving generations of noir fans with a series of unanswered questions. The original 1945 version is available on DVD. I've seen it, and while it does make a lot more sense, it's not as much fun as the theatrical version. The atmosphere: Unlike many noir directors, Hawks doesn't set the mood through tilted camera angles and low-key lighting. There are many night scenes in The Big Sleep, but the locations are all quite obviously studio sets (last week's noir, Mildred Pierce, most have taken all of Warner's fog machine budget). Instead, Hawks uses character to create the seedy atmosphere. The Big Sleep is full of memorable performances especially from Vickers as wild child Carmen (she actually upstages Bacall for most of the film), and noir veteran Elisha Cook Jr. as another menacing hood. Lauren Bacall and Humphrey Bogart on the set of The Big Sleep (1946). Femmes fatale: The Big Sleep is somewhat unique in having not one, but two gorgeous bad girls in the sisters Sternwood. In fact, this movie has several memorable female parts, including a sassy bookstore owner (Dorothy Malone) and a wisecracking cabbie (Joy Barlowe). The dialogue: Hawks is old Hollywood's No. 1 master of dialogue (see His Girl Friday) and The Big Sleep contains plenty of crackling repartee, whether its Marlowe's snide remark about his bad manners ( "I grieve over them on long winter evenings") or the famous conversation about "horse racing" between Marlowe and his lady love (clip below). If you missed The Big Sleep on Friday, you can stream it on Watch TCM. It is also available on DVD and video on demand.